Sunburn, chafing and sore muscles. This pretty much sums up how I’m feeling today. Once I’m up and moving I feel relatively ok, it’s when I sit for an period of time that I start feeling stiff and sore. Oh, and the blah feeling that comes from consuming a strange diet of gels, electrolyte drinks, flat cola, fruit bars and banana muffins over a period of 6+hours in the heat. while I’ve been flicking through the TV channels (we have Foxtel) and reading. A friend of mine is recovering today also, citing nutrition has the thing (if anything) that let him down…enjoy the pizza! Nutrition during the event went ok but a combination of gel sect over a period of time does tend to upset my stomach the day after the event. But I’m feeling better today and the pizza went down well last night! 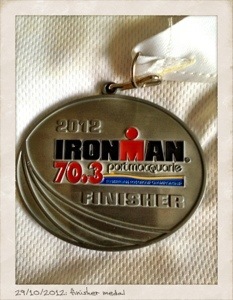 Nice medal – well earned. Enjoy the lazy recovery days. Thanks Ewen. Feeling much better today. Enjoying doing nothing but might go for a walk along the beach today. Couple of days then all the pain will be gone. The memories last forever, well done. Already I’m feeling so much better. Sunburn on my back is the only really sore part now. Not that I plan on doing anything very physical just yet!